With his fondness for jazz piano Brian came to an early musical decision. “When I heard those various guys I said ‘this is what I want to play’ and the early bands I got in when I was 16 or 17 years old, we were playing Jazz Messengers material,” he recalls. “Around this time my dad became very ill, so I thought ‘I had better get a job and help out at least until my younger sister and brother started to work’. I got a gig in a print firm...after two weeks, a supervisor said to him ‘I hear you play the piano’ and I said ‘yes’ and he said ‘I’ve got this gig in London on the West End...its just me and you’. He was a drummer. I go in and play everything, not knowing that I can only play two keys—G and C—I can play all these tunes, but I can only play them in two keys”. With this new group of musicians, it was more like a revue than an actu_al band, but what does one call it? “ If someone really played with a great deal of fire in those days, someone would say ‘that guy’s a steamer, so Steampacket became our name,” explained Auger. Sadly, Rod’s manager, Brian’s manager and John’s manager, feuded over whose label the record should come out on, so they never really recorded anything and Steampacket collapsed in 1966 after one year. However, a live concert video exists of Steampacket playing the Reading Jazz and Blues Festival in 1965, and it is truly a rocking’ experience today. The next album, Definitely What, was Brian’s solo album and was the same year that Brian and Julie’s hit “This Wheel’s On Fire” went to number one in England. “That was primarily on a reel of tapes that was sent called the basement tapes, the Bob Dylan basement tapes,” Brian remembers. “Wheel’s was a strange song. There was an upright bass and Bob Dylan singing the piece,” he continues. “Julie really liked it and I listened to it. I liked the kind of idea there except that I thought it was an album track, not a single. So we decided to go for it and so I started to mess around with this thing trying to put rock rhythms to it and a different kind of rhythmic bass. It just didn’t work, and in the end I just couldn’t get away from the walking bass. “ The frustration in trying to find the proper bass track led to some experimentation. “ Let’s treat it as a jazzier thing, then, almost as a march, let me just think of it as a kind of a march, put it down like that,’” Brian recollects. “ So I put the backtrack down with a piano over the organ on it and some mellatron strings. When Julie added her extraordinary vocal, all of a sudden it was like ‘wow, this is really psychedelic man’.” Psychedelic it was, and the hypnotic effect Brian was searching for helped propel the tune to hit status all over Europe as well as the U.K.
After the success of “Wheel’s” the Trinity obtained a large following, particularly in Britain, with Julie being the lead vocalist. Her soulful voice and mod look, made her the “it” girl of the moment. And with Carnaby Street in full gear, Julie’s voice and vibe made her one of the poster girls of the mod years. Closer To It was followed by Straight Ahead, which also landed on both the R&B and jazz charts. The Express opened for Herbie Hancock’s Headhunters, ZZ Top, Led Zeppelin and others, bridging rock, jazz and R&B genres, and sometimes did straight R&B gigs. “I got a boost in ’75 when Ligertwood rejoined for the Reinforcements album. Oblivion Express kept rolling through most of the 70s, until the group finished touring in 1977. 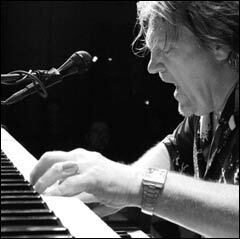 In 1976 and’ 77, Brian was voted the Number One Jazz organist in the world in Contemporary Keyboard magazine, largely behind the strength of his live playing with Oblivion Express. Visiting London in 1977, Auger invited Julie Driscoll to do another album again, and thus the album called Encore, (1977) and one more with Julie followed. After a year off, he did Planet Earth Calling after being approached by Head First Records. Brian would have been content touring Europe occasionally, but fate intervened once again. In ’89, he got a call from Eric Burdon (of the Animals), who “sounded like the Steampacket days all over again, you know, ‘I need someone to put a band together’,” he recollects. Brian hoped that they “could update some of the arrangements and make it really like a great modern band and really nail everybody” but grew dissatisfied after four years because Burdon wanted to stick to Animals music. During those four years, though, Auger was able to tour the whole world (even going behind the Iron Curtain). His son Karma joined the band when the drummer quit two days before a European tour. Karma, working as a drum tech, was the only person around who knew the all the material, and Burdon was kind enough to give him the drum chair. In 1993, Auger decided to leave Burdon and concentrate on his own music. In the mid to late 1990’s, Auger formed his own family version of the Oblivion Express, with his children Karma on drums and Savannah performing, as the lead vocalist, along with a bassist Auger has selected. Before releasing Auger Rhythms. His first career retrospective, Brian toured Europe, where he drew large crowds at several jazz festivals, including a two night gig at the famed Montreux Jazz Festival. And for fans in the States, Brian and the revamped Oblivion Express have started touring all over America at clubs and festivals as well.